High-tech • Employee ownership a key to revivalof FishBowl Inventory. Al Hartmann | The Salt Lake Tribune Fishbowl's President Mary Scott, left, and David Williams, CEO at the company's Orem headqu Al Hartmann | The Salt Lake Tribune Fishbowl's President Mary Scott, left, and CEO David Williams. Al Hartmann | The Salt Lake Tribune Fishbowl's President Mary Scott, left, and David Williams, CEO at the company's Orem headquarters. FishBowl produces software that allows small and mid-size companies to manage their inventory with some of the same tools as large companies. The company is growing rapidly but an investor recently had to cash out so management arranged a buy out that gave them and employees control of the company. Al Hartmann | The Salt Lake Tribune Fishbowl's President Mary Scott, left, and CEO David Williams. In the case of FishBowl Inventory of Orem, the fish now own the bowl. Management has bought out the former majority owners, with employees now able to own 30 percent of the company. Zions Bank provided a loan to close the deal, and management and employees came up with the rest through pay cuts and record sales. The loan reflected the solid prospects for the rapidly growing company, whose software has become the No. 1 inventory-management add-on for Intuit's QuickBooks business-accounting software and whose growth has been spectacular since it escaped extinction. It's quite a turnaround for CEO David K. Williams, whom the former owners sent to Orem in 2004 to close down the then-3-year-old company after an investment of hundreds of thousands of dollars that hadn't produced a product to take to market. Williams said employees didn't know about his mission. At the end of his first day, he was so impressed by what he saw that he called the owner and asked for 30 days to try to produce a product. The staff, some of whom hadn't been paid for six months, responded, and everyone but the engineer turned into salespeople and began to sell the new inventory-management software. "At the end of that year, we had sold a little over $300,000 worth," Williams said. "It was enough to get cash flowing, salaries paid and rent paid, and [it] gave us the confidence to continue." In 2005, the company quadrupled sales, to $1.2 million. Decisions to make the inventory software generic, so it could serve multiple kinds of businesses, and to integrate with QuickBooks have been keys to its growth. QuickBooks' owner, Intuit, has more than $3 billion in annual revenue for its software products used largely by small businesses. "It's given us access to being on their website," Williams said, "and to getting traction with people who are looking for advanced inventory who would actually come to us through QuickBooks." By 2009, FishBowl revenue was $7.2 million, and it was $8.5 million in 2010. But by last year, the owners wanted out. Williams said he couldn't name them because of a confidentiality clause in the buyout agreement. 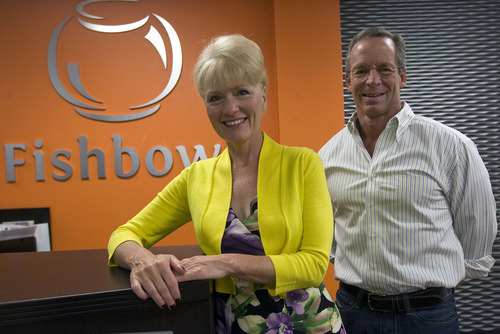 But a 2008 Utah Valley BusinessQ profile of Fishbowl Inventory identified them as Chuck and Beverly Hale. About the same time the Hales sought a buyout, a friend of Williams, Mary Scott, came to FishBowl Inventory from Certiport with an extensive background in employee relations. She became company president. As Williams and Scott looked for potential buyers amid the economic downturn, many prospects were offering only dimes on the dollar for what an appraiser had valued the company. In addition, Williams said the duo wanted to protect the company and employees from those who would gut it for its software code or might close it down. Enter Zions, where Williams said a senior loan officer helped push through the loan for two-thirds the amount needed to close. After employees and management came up with the rest, the deal was done in May, with the former owners taking a secondary position to Zions and agreeing to monthly payments until they are paid off. Skyrocketing growth has continued, landing FishBowl Inventory on Inc.'s lists of fastest-growing companies for 2008 (831 percent three-year growth), 2009 (366 percent) and 2010 (120 percent). FishBowl's software is aimed at small- and midsized businesses and has features that automate tasks and provide live information on inventories. The company's mobile application enables warehouse workers to use handheld devices to enter data and lets information be accessed nearly anywhere. Scott said the company's offering of a site license for use of software bundled with Intuit products has great appeal to small businesses. "Instead of a small- to medium-sized business trying to figure out what are the six or seven product solutions, we bundle them based on their needs and requirements into one site license," she said. Without the site license, a small businesses could spend up to $150,000 on software, she said, whereas a FishBowl Inventory site license is likely to be priced $40,000 to $60,000. The National Aeronautics and Space Administration purchased FishBowl Inventory software and uses it to track ingredients and food used for meals and snacks by astronauts. "FishBowl is an easy-to-use program that allows for multiple users and tracks thousands of serialized parts," Jennifer Brogan, a scientist at the Space Food Systems Laboratory, said in an email. "It also allows us to generate reports to share data more accurately than ever." In a move unusual in the business world, FishBowl's employees can own up to 30 percent of the company through a stock-option program.The partial ownership fits with the business philosophy of Williams and Scott to create a successful company that's also a caring and supportive place to work. "People sometimes won't remember the revenue growth, but we'll remember what we've created and the value," Scott said. One other principle is that bills are paid immediately when they come in, leaving the company free of debt, and the cash on hand was an important factor in the buyout, Williams said. Along with Intuit, FishBowl Inventory has partnerships with other companies, including eFileCabinet, the Lehi company that provides digital document-management software for businesses. FishBowl is also developing software that will deliver inventory information via a Web browser and can deliver applications through remote banks of computers called clouds.